The development is being undertaken by local businessmen Peter Coyle and Terry McEniff and designed by JNP architects. Work on the development is anticipated to begin later this year with a planned opening date of early 2010. 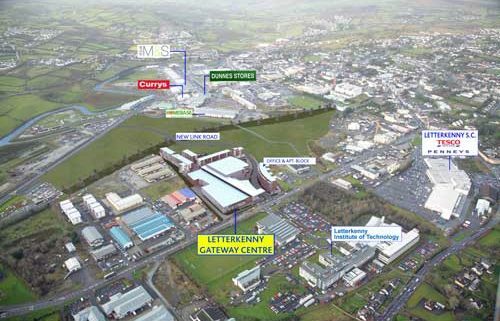 Letterkenny Gateway Centre will comprise a covered shopping mall of 12,000 sq. m. including 2 anchor stores and 25 shop units. Agents Bannon confirm that they have agreed terms for one anchor and are in discussions on the other. The site is strategically located, linking the town’s retail parks with Letterkenny Shopping Centre. A new link road will run along the perimeter of the site, which will link Derry Road with the Neil T Blaney Relief Road, whilst also providing easy pedestrian access to the retail parks. The site is directly opposite Letterkenny Institute of Technology, which has over 2,500 students. 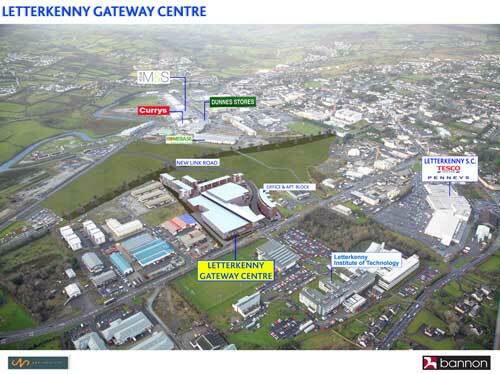 Letterkenny Gateway Centre will comprise an enclosed retail/shopping centre with 2 anchor stores and approximately 25 internal retail units. Additional external retail units will also be provided, together with restaurants, apartments, offices and leisure uses. There will be extensive parking for over 1,250 cars. Letterkenny, with a population of 20,000, is a Gateway Town in the National Spatial Strategy and the commercial and retail capital of the north-west, drawing from a dense catchment in Donegal as well as extending across the border into Tyrone and Derry. The project has already generated strong interest from national and international retailers keen to gain a representation in the Town. Kevin Sweeney, Director of Bannon said the property consultancy is ‘actively engaged’ with a number of well known retail brands.